Nellie Johnston writes to say the she thinks she has found some more information about John Lewis Jacobs who traveled the world as a magician/ventriloquist entertainer. “I have purchased a very thick book called ‘These are the Names”, Jewish Lives in Australia 1788-1850 written by John S Levi the first Australian to be ordained as a Rabbi. It is very fascinating & I have only just skimmed the pages so far. 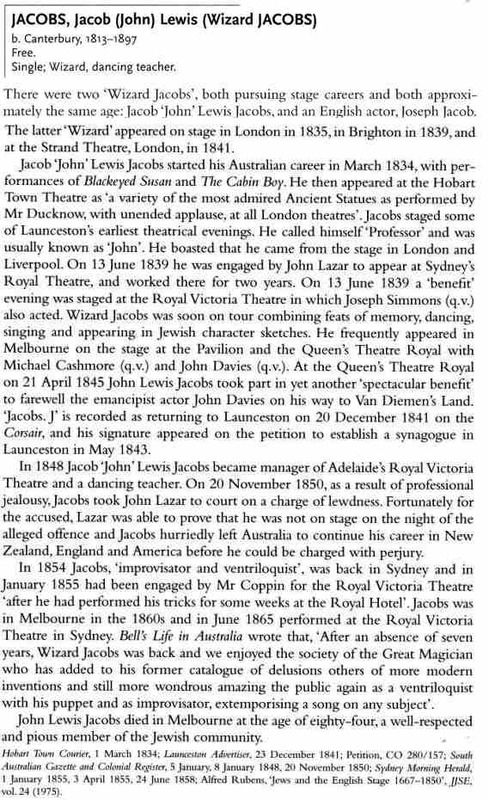 However I went straight to the Jacobs names & there was John Lewis Jacobs alias ‘The Wizard’. Whether this gentleman is connected is uncertain, but it certainly makes interesting reading. On the next few pages we see the fruits of Nellie’s research. He is identified as being in Australia in 1834 with reports of being in the UK in 1835 and 1839. He was back in Australia in 1839. 13 and 14 September 1866, pages 2e and 2g. 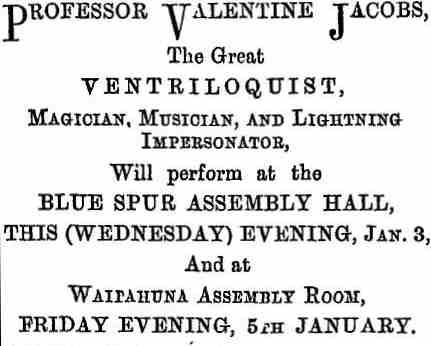 Mr Jacobs, the great professor of modern magic entertained Adelaideians in the 1850s and invariably filled the theatre. On a night I attended every part of the house was occupied and many distinguished colonists, with the younger branches of their families, occupied seats in the dress circle. The interior of the house presented a very improved appearance from the tasteful arrangements of the Wizard. Chapman’s band filled in the intervals with its gayest airs and popular operatic selections. In being cheated as to cheat. He then introduced his familiar ‘Sprightly’ and rearranged his apparatus in which the audience did not observe a stuffed crocodile, an owl, a skull or cabbalistic characters, such as the magicians of old were wont to startle their disciples with, but rather a gaily arranged collection of boxes, vases and glasses – a small windmill and a Lilliputian tavern being the most conspicuous pieces of mechanism standing on the tables. Then began the real business of the evening. Cards were handed to ladies and gentlemen who noted and returned them to the pack when, hey presto, the Wizard produced them in a most unaccountable manner from the most inconceivable places. Half-crowns and watches, borrowed from the audience, played fantastic tricks, and were returned safely to their owners. A lady’s pocket-kerchief was burned on the stage and finally taken out of a hat which was empty the moment before. A magic bottle yielded its inexhaustible supplies of various liquors until the Wizard’s arm must have, as he declared, ached in dispensing what the total abstainers call ‘the great deception and snare of mankind.’ The Wizard next gave the audience a taste of his qualities as an improvisator, and certainly had supplied to him a series of words which it was almost impossible to connect with rhyme and reason. In the course of his extempore ditty he made a few good hits, such as on the word ‘Punch’. He complained that the gentlemen who gave it should have explained whether he meant Punch to read, punch to drink or a punch on the head; if the latter he must refer him to ‘Sprightly’. The word ‘Villikins’ enabled him to pay a compliment to Coppin which was immediately perceived and acknowledged by the audience; while to a person who gave the words ‘Jim Brown’ he expressed, with witty malice, a fear that his friend would ever after be known by that nickname. It would be useless to attempt a further description of the tricks, especially as some of them were indescribable. I might say, however, that the colloquial part of the entertainment was excellent and the by-play of ‘Sprightly’ intensely amusing. The ventriloquism which concluded the performance was much and deservedly admired.